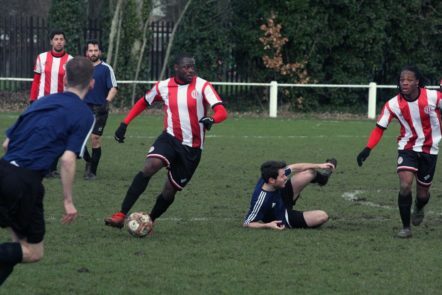 Clapton consolidated their recent upturn in form with a statement win against Wilberforce Wanderers at the weekend. The scoreline probably didn’t do justice to a tidy away side, but the majority of the chances fell to the men in red and white. 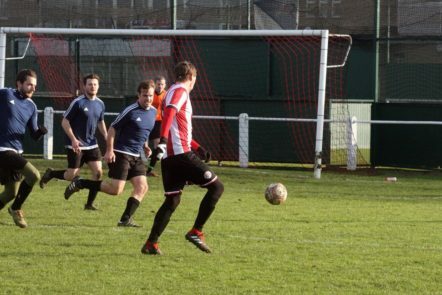 And the men in red and white ruthlessly dispatched quite a lot of those chances. 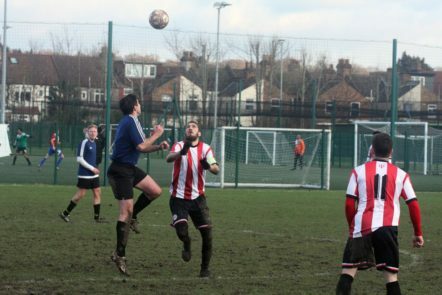 There was concern through the week that the cold weather would endanger this fixture. But the Stray Dog surface was perfectly playable – if a touch heavy. However, the game was almost called off for a more ridiculous reason: for the second time this season, the opposition forgot their kit. Wanderers dashed to Sports Direct to pick up some generic football wear -and the match got under way fifteen minutes late. 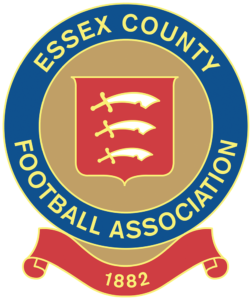 Tons were getting flashbacks to last time, when they could have claimed a victory for the delay but chose to play and got taken apart by Ealing Town. This game played out very differently. Clapton Community started slowly, with Wilberforce wandering where they liked, passing the ball crisply. But the first big chance fell to the Tons. A Stefan Nielsen free kick dropped perfectly in front of an unmarked Eliot Crosbie right in front of the Wilberforce keeper. But the Tons targetman, playing in a deeper midfield role, couldn’t get his feet in order and ball bounced harmlessly wide. The opening goal settled the nerves. A Sherwin Stanley throw-in bounced back to him. He popped it back in. Crosbie headed it on. 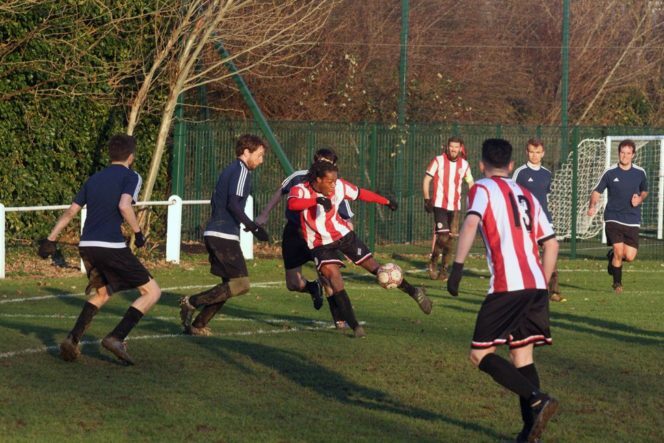 Wing whippet Josh Adejokun smashed home from close range. The same man doubled Clapton’s advantage just before the 20 minute mark. A clipped Nielsen ball from the left glanced off a Wilberforce head. Adejokun adjusted himself to the new trajectory and nodded down into the corner. Due to some kind of bizarre optical illusion, no-one in the stand seemed to notice it had gone in. Adejokun gestured to the fans to celebrate. The fans realised it was a goal and celebrated. Left winger Jake Stevens has impressed since establishing himself in the side of late. Coming up to the half hour mark, he sold his marker a dummy on the edge of the box, but curled the shot just over. 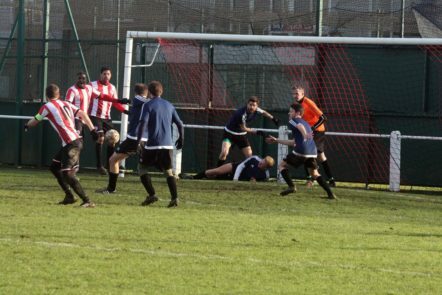 Clapton’s third goal came from a viciously whipped Nielsen corner. Stanley got his head to it. 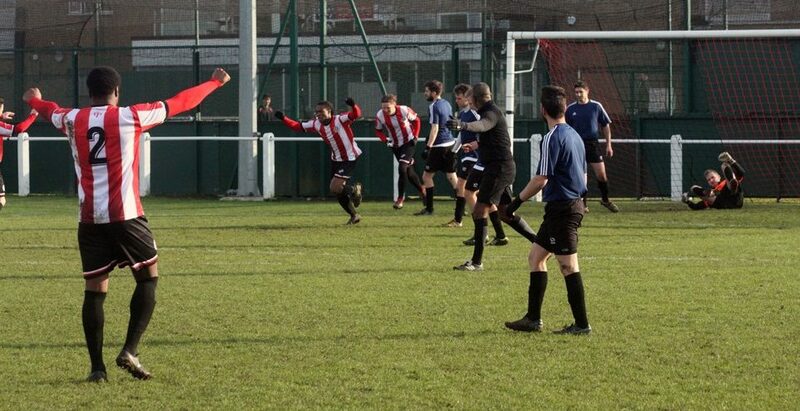 A Wilberforce defender desperately dug it out, but the ref ruled that it had crossed the line. In the dying embers of the half, Stanley had a chance to get another. 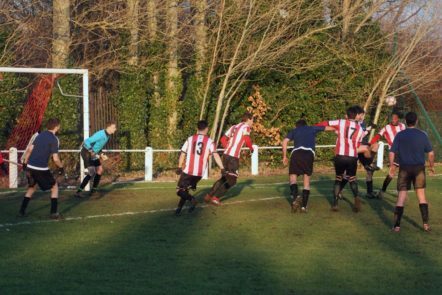 Played through in a wide position, but tightly marshalled by two Wanderers, the Clapton hotshot managed to steal a yard and poke a low shot towards goal. The rooted away keeper was relieved to see it slip wide of his far post. Then left back Liam Smyth dipped one in, speculatively, from the corner of the box but didn’t quite dip it enough. Twice at the start of the second half, CCFC tried to thread Adejokun through. Twice the opposition goalie charged out to nick it away in the nick of time. 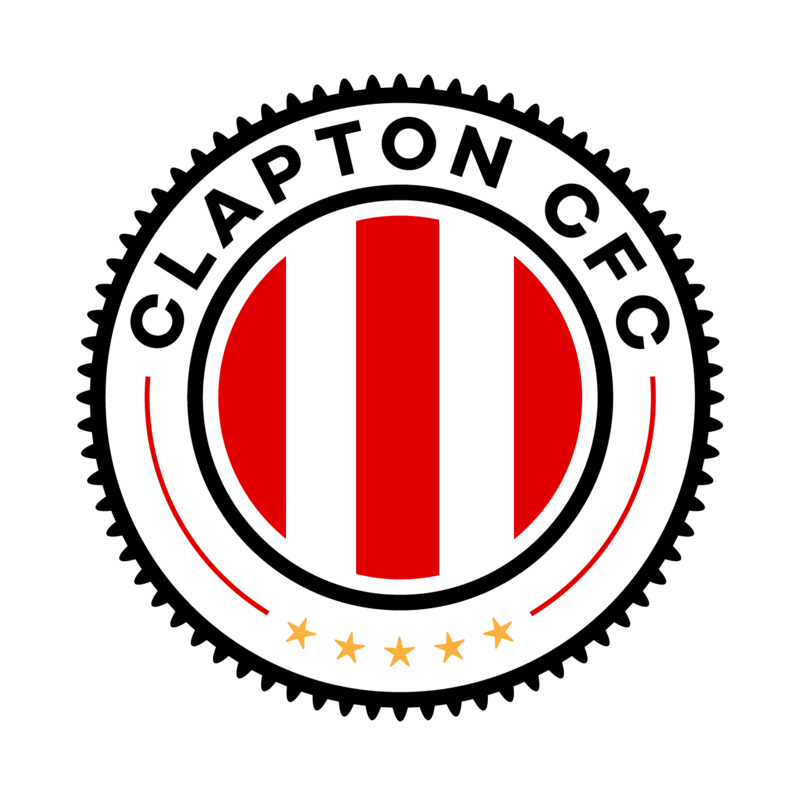 But Clapton didn’t take long to extend their lead. Another Nielsen corner into the very heart of the danger zone was headed in by Crosbie. A couple of minutes later it was 5-0. Stanley played it out to irrepressible handful Stevens. The winger marauded down the left, made a Wilberforce defender fall on his face using trickery, then cut back to the onrushing Stanley. The striker banged it off the goalie and into the corner of the net. It was Stanley’s second of the game – and fourteenth of the season. Into the final quarter of the match, Wanderers had a chance to pull one back from the spot when one of their forwards was bashed to the ground in the box by Dean Bouho. But the weak trundler from the Wilberforce number ? (the shirts they picked up at Sports Direct didn’t have numbers) was easily blocked by Dan Anfossy. It was the keeper’s third penalty stop in three consecutive games. At the other end, Crosbie quickly made Wilberforce pay. Galloping down the right touchline, he clipped a long range cross-shot towards the back stick. It floated gloriously in to make it 6-0. Crosbie has history with cross-shots that float gloriously in, so he gets extra benefit of the doubt. Into the final ten, the visitors snatched a consolation. A Wilberforce player looped a half volley over Anfossy to deny the home keeper his clean sheet. These three points crucially help CCFC try to keep pace in this competitive league. The Tons will be hoping to take this momentum into a tough clash with NW London in Haringey next Saturday. Gaffer Geoff Ocran and second-in-command Stu Purcell talked to us about the comfortable win. We also heard the thoughts of friend-of-the-club Andre Thomas, Barking FC’s assistant manager . Eliot Crosbie scores quality goals and makes thumping tackles. That’s what he does. I think it was just what the first wave of new Tons fans seemed to be drinking and then the rest of us copied to fit in!